Isabella is a cast stone fireplace mantel. The cast stone fireplace mantels can be made-to-order to fit the fire box that you have. Most of our surround can be made to your dimensions. This is a simple traditional design that looks great in travertine to give it an even more old world antique feel. 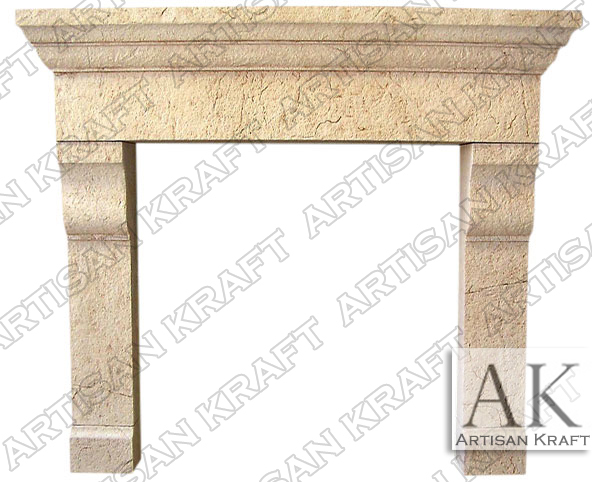 Artisan Kraft also offers many great modern mantel and contemporary designs. Old world traditions and modern innovation allow us to achieve the highest standards of quality in our fireplaces. Typical Dimensions:60″-80″ wide x 50″-56″ high *can be made to custom dimensions for no additional charge within limites. Stone: Cast stone, limestone, travertine, sandstone, marble, travertine etc. Available in many different colors, textures and finishes. Isabella pictured in plaster is a fireplace mantel that can be made from many differnet stone to achieve differnet looks. Our cast stone fireplaces are light and easy to install making them great for remodeling.